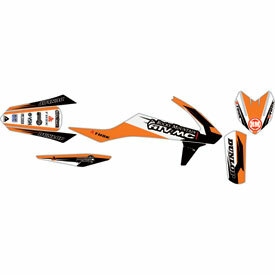 The Attack Graphics Custom Roost Full Trim Kits are made when you order, all orders will ship within 48 hours! 2 business days Monday-Friday. These graphics are sweet. however, it is not easy to install. do not recommend unless you are skilled. well it was crunch time, we waited until the last week until the race season started. we put all new plastics on my son's 2015 85cc ktm . I went to Rocky Mountain ATV/MC and found just what we were looking for. they came 3 days later and looked great they really popped..